Snow Day 2015! 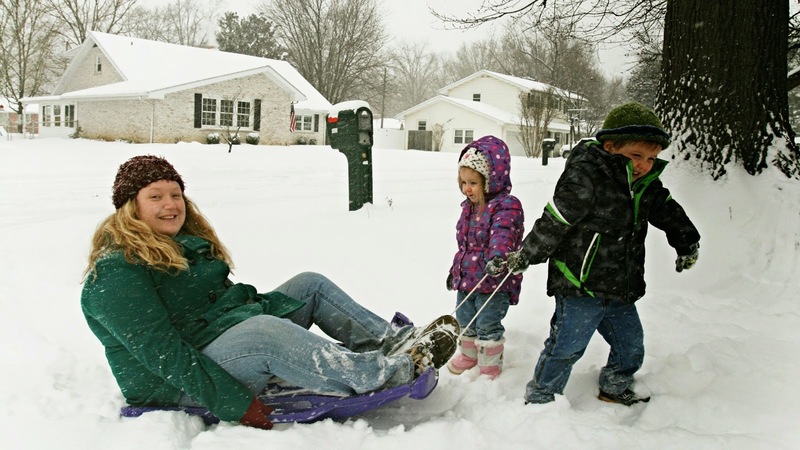 | Back Home Again: Snow Day 2015! The last time I had a snow day where I got to enjoy myself was on President's Day was when I was in college and we got six inches of sleet, here in Evansville. This time around we have around seven inches now that the snow has finally stopped...I think. I love this photo Alan took...if only there weren't trash cans all along the street. We took a vacation day today because while the roads weren't super terrible in the morning, we knew that by the time we were to come home, they would probably be pretty bad since the city can't handle an inch, much less seven inches of snow. After last year's winter, when we got a bunch of snow and I spun across three lanes of traffic and back before getting stuck trying to get to daycare to pick up the kids, there was no way I was endangering all of us by getting on the roads. Because we hardly ever get snow down here that actually stays around to play in, we took the kids out briefly. We don't have any hills in our neighborhood, so the only "hill" they got was a snow drift against a tree. Ewan enjoyed it, but Cecily just thought it was lame...so like her mommy. I used to go out and fly down the hills in the woods behind my mom's house with my neighborhood friends, on the very same purple sled I pulled the kids with. Ewan of course wanted to pull me on it too. We ended our time outside with some snow ice cream. I grew up in Northern Indiana, where we got plenty of snow but I had never made it before. I added some cocoa powder in so we had vanilla and chocolate. Pretty good! It was so nice to be able to be a kid again and enjoy our snow day, even if it was just for a few hours. If you got snow today, I hope you were also able to get out and have fun too! I love these pictures! It looks like you all had so much fun! Thank you. We did! The kids have only played in the snow twice before this so it was so nice to be able to enjoy it with them today. 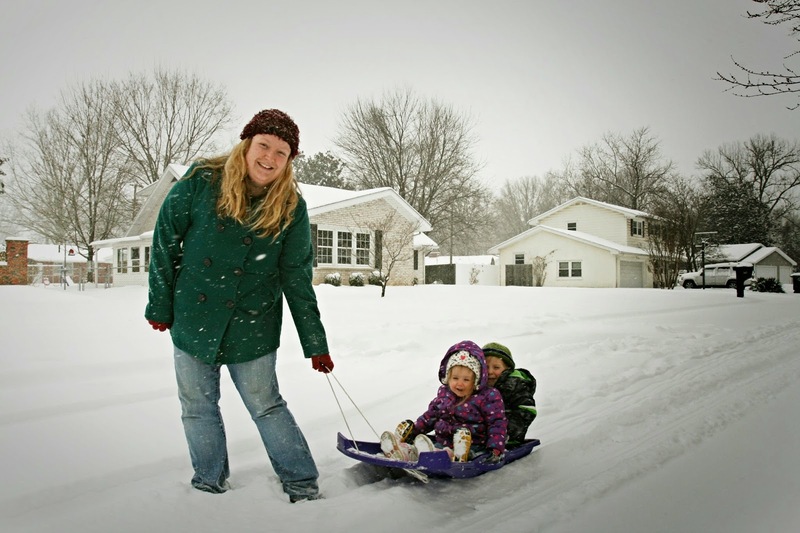 I hate the cold so I rarely play in the snow with my kids - good for you! we made snow ice cream once and it was yummy. I LOVE snow and hate that we almost never get it here. You better believe I was loving being outside yesterday! Lucky you!! We were supposed to get around 7 inches of snow, but all we got was ice. Wonderful pictures! We always are getting the snow up here by Lake Erie. I've developed a pretty bad attitude about it, but you make it look like so much fun. Your kids look so adorable in their hats and boots. Ugh! I love winter and while I think ice can be really pretty, it creates such a mess! I grew up in Northeast Indiana and they get lots of snow up there. However, southern Indiana doesn't get much at all usually - we don't even have snowpants for the kids because they're not worth the money spent! Even though winter weather creates a mess, I love getting out to play in it, even for a little while. 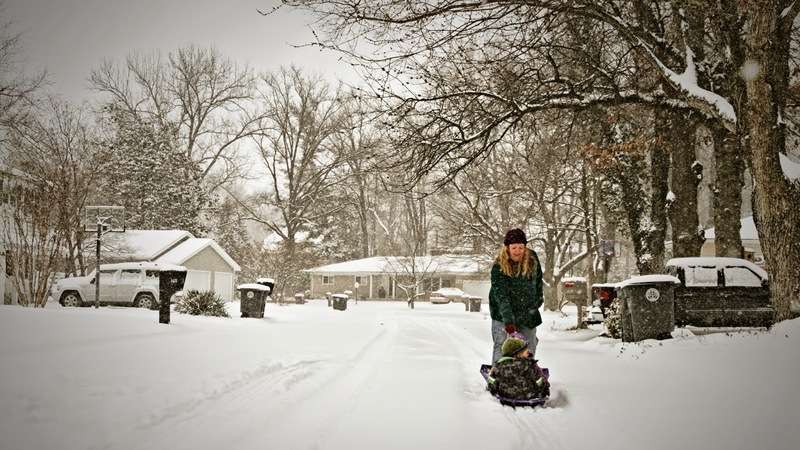 I so want my kids to have fun memories of playing in the snow like I do. We can never move any further south haha! Awesome memories your making there! Today is snow day #2 and I would imagine #3 is tomorrow. I think we hit 6 inches here, but we're projected for more tonight. Not sure where this bacth is coming from! I thought we were done until Friday. As a teacher, I've enjoyed two days in sweat clothes. I have been working, however. Grading papers, on the blog, laundry, just not getting dressed or leaving the house. #creativebloggersnetwork visit! We really should've stayed home today because the roads were scary coming to work this morning. But unfortunately, we couldn't. We're supposed to get another couple inches tonight so it'll be interesting! That looks like a lot of fun! Must be great for the kids too. We have hot weather all year round so would love to experirence some cold weather :-) Via Creative Bloggers!